Welcome back to another day of encouragement to live a healthy life! The food you eat is SO important, but it does take work to eat healthy food, especially vegetables. As a stay-at-home, homeschooling, side hustling momma, I have my plate very full most days. So how do I do it? What exactly do we eat? How can I cook healthy food consistently for my family? Today, I’d like to draw back the curtain and show you what a week of AIP (with a few reintroductions which are marked) eating looks like for me and my family, a low-pressure week of healthy eating! I have two basic mantras when it comes to consistent, healthy eating: make a plan and plan ahead. A menu plan is critical to be able to consistently put healthy food on the table. I’ve talked extensively about my method of menu planning, so I won’t go into detail here. Instead, check out these posts: Menu Planning 101 Part 1, 2, 3, 4, and 5. Armed with a menu plan, I know what food is available in my house for any meal, at all times. I keep my menu plan posted to the side of my refrigerator for quick reference. A menu plan is not a strict plan for exactly what to eat each day. Move meals around to fit the needs of your family for that day or week. 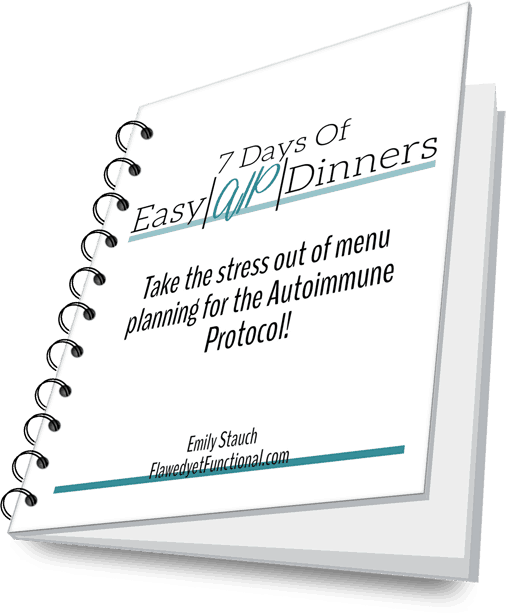 A plan simply allows for flexibility without the stress of “What’s for dinner?” every night. So you need a plan. Learn how to make one in my menu planning series. The next tenant I hold tightly to is planning ahead. This is not in reference to what we’ll eat for the week, that is covered in Make a Plan above. What I mean is plan for leftovers, plan for trips, plan for portable meals as needed, and plan for a break from cooking. Planning ahead for the activities and commitments your family has each week allows you to be prepared each day with food to nourish your family. If you don’t plan ahead, take-out or cheap, unhealthy meals are likely to occur! To do this, make quick notes off to the side of your menu plan so you don’t forget why you planned the meal you did for that day! Need a menu plan template? Download one here! You can do it! Plan ahead for the bumps that are sure to be in your family’s schedule! With those two ideas in mind, let’s take a look at what we actually eat in a week. Day 7 – Leftover Day! A well thought out meal plan will leave your home with enough food to feed everyone for the time planned, minimize waste, and increase the healthy food consumed. Yes, Paleo or AIP eating means more time in the kitchen, but it can be managed by planning ahead. This week of meals is typical of how I plan and feed my family every week. If I can do it, so can you! Following the AIP or Paleo diet CAN be low-key. Does it take planning and practice? Sure, but you can adjust your expectations and learn to make a plan that is manageable for you. Could you use a low-pressure week of healthy eating? Try this menu out and let me know what you think!